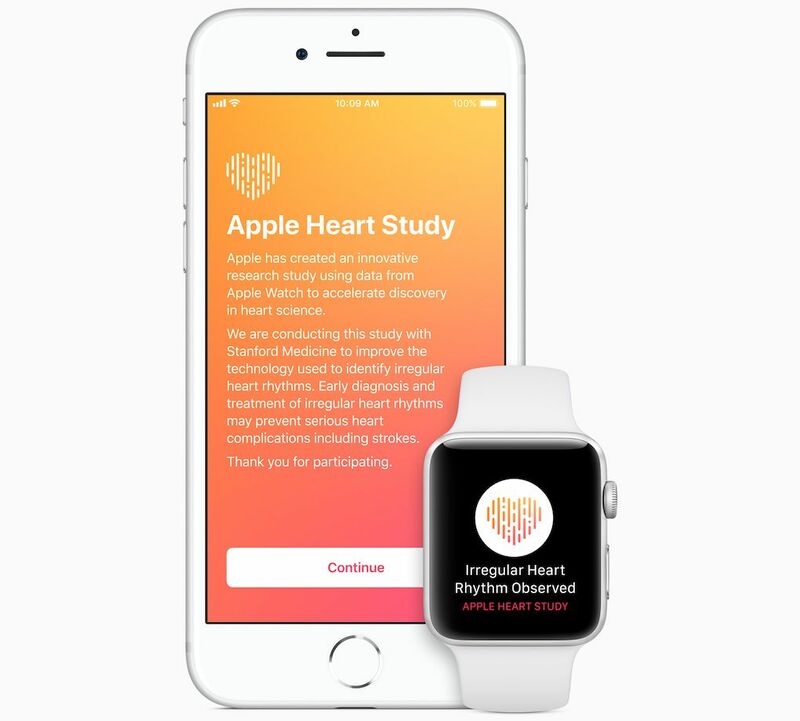 Apple and the Stanford University School of Medicine each issued press releases today citing the results of the Apple Heart Study that they jointly announced in November 2017. Stanford Medicine also took its findings to the American College of Cardiology’s 68th Annual Scientific Session and Expo today. Apple fully funded the study. The Apple Heart Study, which did not include the Apple Watch Series 4 (with its built-in ECG feature), included 419,093 participants. Apple says people from all 50 states participated over the course of eight months, and according to the university, around 0.5 percent of all participants — over 2,000 people — received notifications alerting them of heart rate irregularities over the course of the study. Researchers deemed this “an important finding given concerns about potential over-notification,” suggesting that merely being part of the Apple Heart Study wasn’t a burden for most people involved (or an unnecessarily distraction for their doctors). Many health experts are concerned that giving consumers more data to pore over isn’t necessarily a good thing and could be a strain on health care systems. In instances where users received an irregular heart rhythm notification, doctors gave study participants were a digital consultation, as well as an electrocardiogram patch for further monitoring; readings of their electrical heart rhythm were recorded for up to a week using the proper ECG patch in these cases. Comparisons between irregular pulse-detection on Apple Watch and simultaneous electrocardiography (ECG) patch recordings showed the pulse detection algorithm (indicating a positive tachogram reading) has a 71 percent positive predictive value. 84 percent of the time, participants who received irregular pulse notifications were found to be in atrial fibrillation at the time of the notification. One-third (34 percent) of the participants who received irregular pulse notifications and followed up by using an ECG patch over a week later were found to have atrial fibrillation. Since atrial fibrillation is an intermittent condition, it’s not surprising for it to go undetected in subsequent ECG patch monitoring. Fifty-seven percent of those who received irregular pulse notifications sought medical attention. From the sound of it, Stanford is treating the Apple Heart Study as a stepping stone into additional research into just how useful wearable consumer devices can be in monitoring our day-to-day health and predicting trouble. “Atrial fibrillation is just the beginning, as this study opens the door to further research into wearable technologies and how they might be used to prevent disease before it strikes – a key goal of Precision Health,” said Dr. Lloyd Minor, Dean of Stanford School of Medicine. We know these devices (from Apple and many other companies) can and continue to save and improve lives, but catching undiagnosed health issues is several layers beyond monitoring core fitness activity and whether your heart is beating as it should, which are the duties of most consumer wearables today. There’s little room for inaccuracy if tech makers want to take the next step. And again, this study only involved the Apple Watch up through Series 3, so it relied on the device’s optical heart rate sensor for a lot. When you strap in for a heart check at a medical facility, there’s more specialized equipment at hand. Even with its newer Apple Watch Series 4, Apple has tried to be clear in saying that the ECG feature isn’t any sort of medical diagnostic tool. If there are several consecutive abnormal readings, it will flag that to you. These devices aren’t for self-diagnosing your health or acting on the information they show without seeking input from a real doctor. Smartwatches and fitness trackers can detect irregularities or sudden falls, but aren’t yet at a place where anyone should fully rely on them to do so.